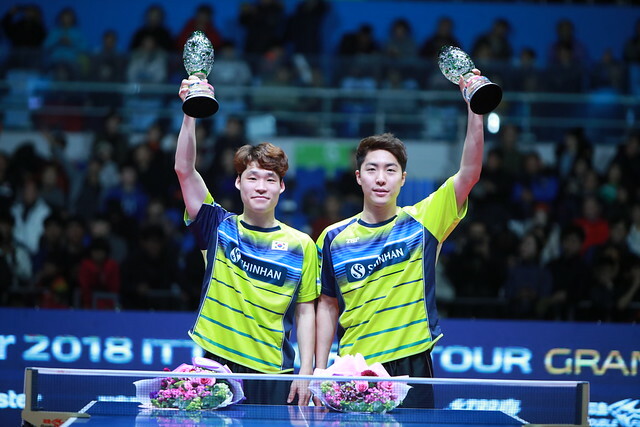 Winners in Panagyurishte on Sunday 19th August at the Seamaster 2018 ITTF World Tour Asarel Bulgaria Open; China’s Xu Xin and Ding Ning can anticipate invitations to compete in the end of year Seamaster 2018 Grand Finals to be staged from Thursday 13th to Sunday 16th December. However, will colleague Fan Zhendong, the winner last year in Astana, in addition to Lin Gaoyuan and Ma Long be present? Similarly will the name of Zhu Yuling appear on the invitation list? Moreover, will Brazil Hugo Calderano finish ahead of all Europeans? Xu Xin holds a commanding lead in the Men’s Singles Standings (1,325 points), he is clear of Ma Long (1,050 points) and Fan Zhendong (1,039 points); both undoubtedly have sufficient points to qualify for the Grand Finals but neither has met the minimal five appearance criteria. Ma Long has made four excursions, Fan Zhendong has been present on three occasions; neither has entered the forthcoming Seamaster 2018 ITTF World Tour Czech Open, only Sweden and Austria remains. Thus Ma Long must compete in one of the two European tournaments; Fan Zhendong must be present in both. It is the same situation for Lin Gaoyuan in fifth place (600 points), as it with Fan Zhendong; in order to qualify, he must play in both Sweden and Austria. Currently he is one place behind Japan’s Tomokazu Harimoto (738 points) and one ahead of Korea Republic’s Jang Woojin (574 points). Both Tomokazu Harimoto and Jang Woojin have each appeared seven times. However, note the next name on the list; it is Brazil’s Hugo Calderano. He is in seventh place (538 points), ahead of players from all continents other than Asia and most notably ahead of all Europeans. A Latin American ahead of European adversaries; it is a situation that has never happened before in the history of the ITTF World Tour. In 1996, the very first year of the concept, Argentina’s Liu Song finished the year in fourth position but behind Canada’s Johnny Huang, Austria’s Werner Schlager and Sweden’s Jan-Ove Waldner. The leading Asian was the player next on the list, China’s Kong Longhui. He progressed to win at the Grand Finals in Tianjin beating Vladimir Samsonov of Belarus in the final. Longevity and of course Vladimir Samsonov continues to ply his skills on the ITTF World Tour but at no.62 on the Men’s Singles Standings (39 points), he is not in serious contention for a place in the Grand Finals; however that does not apply to another player who defies the years. Beaten by Vladimir Samsonov in the second round in Bulgaria, Chinese Taipei’s Chuang Chih-Yuan climbs from no.18 to no.16 (271 points) and is within range of a Grand Finals invitation. Should it happen, he will be making no less than his 19th appearance in the prestigious end of year tournament! Meanwhile, on the Women’s Singles Standings, Ding Ning climbs one place and now occupies the no.4 spot (950 points); by competing in Panagyurishte, she met the five appearance criteria. Similarly, for those listed above, China’s Wang Manyu (1,255 points) and Liu Shiwen (1,294 points), alongside Japan’s Kasumi Ishikawa (1,270 points) all have met the qualification criteria. The question mark is over Zhu Yuling, she is in sixth position (575 points), one place behind Japan’s Mima Ito (796 points), who has appeared eight times; however, to date Zhu Yuling has only competed three times. She is not present in the Czech Republic; thus she must play in both Sweden and Austria. Play in the Seamaster 2018 ITTF World Tour Swedish Open commences on Thursday 1st November; Austria one week later on Thursday 8th November.